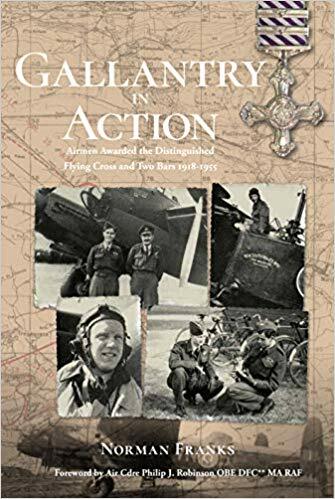 Gallantry In Action, ISBN: 9781911621287 - available from Nationwide Book Distributors Ltd NZ. When the Royal Flying Corps and the Royal Naval Air Service merged on 1 April 1918, to form the Royal Air Force, the new command needed to have its own gallantry medals to distinguish itself from the Army and the Royal Navy. Thus the new Distinguished Flying Cross came into being. Not that this new award (along with the Distinguished Flying Medal for non-commissioned personnel) came into immediate use, but as 1918 progressed, awards that earlier might have produced the Military Cross or Distinguished Service Cross, became the Distinguished Flying Cross. By the end of WWI a large number of DFCs and First Bars had been awarded, but only three Second Bars had been promulgated for First War actions. Before WWII erupted, only four more Second Bars had been awarded, for actions largely in what we would now call the Middle East. By the end of the WWII, awards of the DFC and First Bars had multiplied greatly, but only fifty Second Bars had been awarded (and Gazetted), making fifty-seven in all between 1918 and 1946. To this can be added three more, awarded post-WWII, between 1952-1955, making a grand total of sixty. Still a significantly small number of members of this pretty exclusive ‘club’. Within the covers of this book recorded for the first time together are the mini-biographies of all those sixty along with the citations that accompanied their awards, or in some cases the recommendations for them. Also recorded are citations for other decorations such as the Distinguished Service Order, et al. The recommendations were often longer than the actual citations themselves, and during periods of large numbers of all types of awards, these citations did not make it into the London Gazette, recording name of the recipient only. As the reader will discover, the range of airmen who received the DFC and Two Bars, cover most of the ambit of WWII operations, be they fighter pilots, bomber pilots, night-fighter aircrew, aircrew navigators, engineers, etc, or reconnaissance pilots. Each has interesting stories, proving, if proof be needed, their gallantry in action.